1 - Would it already be possible to add some noise to a 3D object for example with a loop ? Like I could set the noise to loop at 10 seconds and export a movie of for example 10 seconds. When I'd loop the movie the motion would smoothly loop infinite. Did I miss a way to use the already built-in nodes to add some loop to Noise ? If not, what should the Feature Request be like ? 2 - Note that the motion seem to move in a direction, like a ripple. And this is somehow a 2nd question, I tried combine Ripple 3D Object and Add Noise to 3D Object but even if loop was supported in Gradient, the Trapcode sample seem to displace with ripple or direction, the vertices move to a direction and seem to change position. What other nodes or node modification should we need in order to achieve something similar to the Trapcode sample ? I'm joining another Trapcode Sample somehow similar, here the motion is centered like a vortex in a torus. Also joining a composition as a start to recreate something similar. Copyright to Trapcode - Peder Nordby for the movies. Well, the upcoming GLSL stuff will offer some shaped vertex noise opportunities (even though I'll be struggling with the shader language stuff for some time to come). jersmi thanks for the input ! Ok. Yeah me neither. We'll see though. Somehow a good idea to investigate, Displace with Image ! Displace with direction, like a ripple with noise. Loop on a given time to make endless movies. Or what changes or new filters could be added for these. I guess Displace with Image will work pretty well with plane surface, less with shaped 3D objects ! This is a fun problem! Here's what I meant by using Displace 3D Object with Image. As you mention, Bodysoulspirit, it would be nice to have some control over Add Noise to 3D Object (like a seeded version). However, this comp does create "ripple" effect and allow looping to create movies. Also, the node displaces the surface of a 3D Object, so not sure what you mean by only being good for planes? Here's what I meant by using Displace 3D Object with Image. However, this comp does create "ripple" effect and allow looping to create movies. But as Make Random Image or even Make Noise Image doesn't seem to allow a real loop (I may be miss something) you still have to wave the displace value in order to create a loopeable movie where it would loop at "No Displace". This doesn't allow smtg like Peder's GIF. So not sure what you mean by only being good for planes ? What I mean with plane objects is that 2D don't always map correctly on a 3D object. Take a torus for example, hard to map an image on it that would look good on all sides. This becomes visible if you rotate the 3D object in your composition (see modified comp below), the beginning and the end of the image become visible on the 3D object. What I also like in Peder's gif is that the object vertices seem to really move in a direction. Don't know if this is for real or just an impression. Perhaps this could be faked wit the actual nodes by additionally spinning the 3D object. The 1st Trapcode GIF have differences with the Second sample, the torus movie. 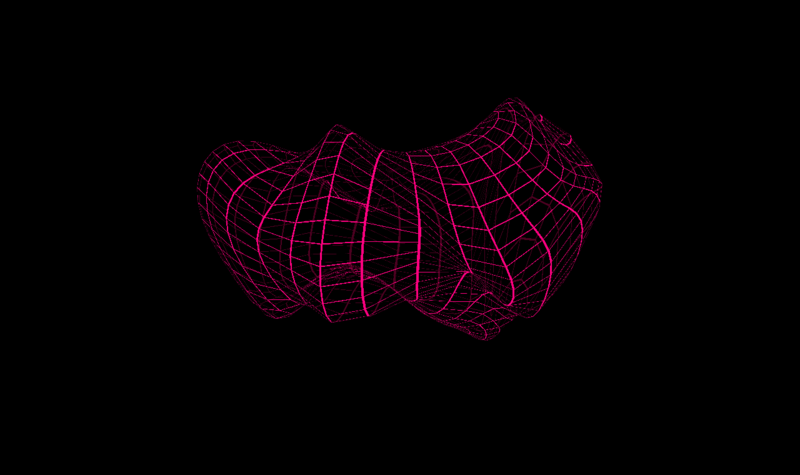 The first one seem to displace the vertices in a direction, with a noise + a loop. The second one sets a noise what seem to be called "Multi Smooth Ridge Fractal" and then ripples the vertices in one direction only (called animate fractal offset Z). Guess there is a difference between the 2 techniques he's using. So thanks Jerry for the ideas and composition ;) Guess some additional node improvements or node set could be easier though ! Guess some additional node improvements or node set could be easier though ! Love to see them! What would you propose? Maybe something like Make Fractal Noise with seed and transform? Yep, Peder's evolving/moving cloud-like noise looks interesting. Make Random Image works for looping because the noise has a seed (whereas Make Noise Image does not). So a mirrored loop using Curve with seed loops seamlessly. But it's still not as interesting as Peder's noise algorithm. Peder's is growing and shrinking as it moves, so it has to have some parameter animating somewhere. Essentially, this amounts to a curve over some displacement value. So yes, even with Make Random Image looping, it's not evolving because each seed is a new random image. What I mean with plane objects is that 2D don't always map correctly on a 3D object. What I also like in Peder's gif is that the object vertices seem to really move in a direction. I think that's an illusion. I see the examples as some interesting fractal-ish noise algorithm moving across the vertices, deforming/displacing as it goes. I think the torus example is essentially displacement with a fractal image. Love to see them ! What would you propose ? Don't know if it would be better as a single node or as a set. So that was a bit the reason of this discussion. As written before, what I like with his "fractal' is that some parts are "noised" very thinly, like scaled to 0,1, and some parts bigger. As the screenshots below show, combing 2 Add Noise to 3D Objects can get pretty much the same results. Just don't know how different "Fractal" could be from "Noise" as a node, nor if it would be GPU friendlier. Combining 2 nodes splits the FPS / 2 on my GPU (which has some bugs anyway so it a not a reference). Will check your sample again, thanks !. Yes you may be very right ! Whoa, cool new markup menu for posting! Exciting prospects for Vuo 1.3! And George Toledo has an Ashima noise node in the Node Library. @jersmi ;) Thanks will check. jersmi ;) Thanks will check. Peder is amazing ! Love his work ! Made only few Shadertoy but so much nice stuff on his Instagram and Twitter and Vimeo. The great thing he is a one man company now a standard in the VFX industry. Vuo is not so trapped ;) Hope one day he'll come to make some nice stuff with Vuo too. I already spoke with him about it, he said Vuo looked cool but finds it hard to know what software to spend time with. Trapcode plugins have truly been some of the most beloved plugins for AE folks (me being one of them). I had not explored any info about the author, however. At the shadertoy site, I found it enlightening to get a glimpse how Mr. Trapcode might be thinking about his own work. As i head towards a bit of GLSL, I find the shadertoy community impressive. 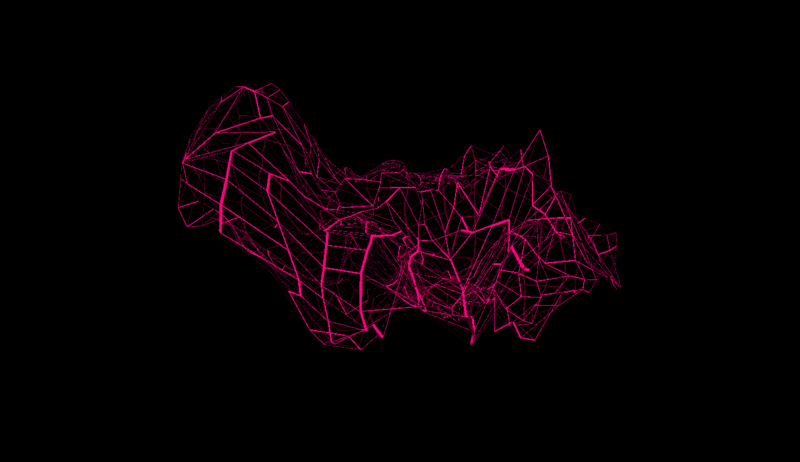 I went looking for "noise" and found the trapcode shader. It clicked because of your post, Bodysoulspirit -- very cool. Some interesting compositions and ideas already posted on this thread. Either Displace 3D Object with Image (possibly in conjunction with Vignette Image) or Add Noise to 3D Object could work. Here are a couple of demos with Add Noise to 3D Object. 5-second-loop.vuo — If you export a 5-second movie from this composition, it loops seamlessly. The way this is accomplished is with two Add Noise to 3D Object nodes. One has its time input offset to 5 seconds after the other's — noise #2 does the same thing as noise #1 but 5 seconds later. When the composition starts, noise #1 is at time=0 and amount=0, and noise #2 is at time=5 and amount=1. From 2 to 3 seconds after the composition starts, it crossfades from noise #2 to noise #1. At 5 seconds after the composition starts, noise #1 is at time=5 and amount=1, and noise #2 is at time=10 and amount=0. Since the 5-second rendering of the composition starts and ends with a noise at time=5 and amount=1, the first and last frame are identical. scrolling-noise.vuo — This one makes the noise move across the object. It does this by transforming the object, applying the noise, and then un-transforming the object — so that the object moves through noise-space but doesn't move through scene-space. You guys mentioned fractal noise. That's covered by the "multiple noise levels" (octaves) portion of feature request Extend "Make Noise Image" to support multiple noise levels, tiling, spherical mapping, and Voronoi noise. Ashima's noise implementations are used in several Vuo nodes: Make Noise Image, Add Noise to 3D Object, Explode 3D Object, Frost Image, and Shade with Frosted Glass. thanks for the compositions ! Cool ! But I still wonder ! Could I still make a feature request to make this easier ? Some noise with seed or something ? So people could make some easy loop noise ? Ok. The movement is not so obvious on the sphere, in just looks as if it is noising faster. Will try on another object. Thanks ! Still wonder if "directions" could be added to make this easier too ! But that FR is for "Make Noise Image" only right ? So for Displace with Image. Fractal Multiple Levels for Add Noise to 3D Objectwould still need at least 2 nodes right ? I can live with that though ! Shaded the spheres with wireframe and made the normal noise sphere move faster. But I can't see any difference between the 2. If you increase the Subdivisions on Make Icosphere, you should start to see the noise flowing downward. But that FR is for "Make Noise Image" only right ? Oh right. Though adding multiple noise levels to Add Noise to 3D Object should be fairly easy to build on top of that FR (similar GLSL code). Could I still make a feature request to make this easier ? Some noise with seed or something ? So people could make some easy loop noise ? What do you mean about noise with seed? (I'm not sure how a random seed would help here.) It would be good to make it easier somehow. With the scrolling noise comp, leaving the time port disconnected on Add Noise to 3D Object might help clarify the idea of moving an object around in "noise space". Also, simply rotating an object in noise space has its own charm.